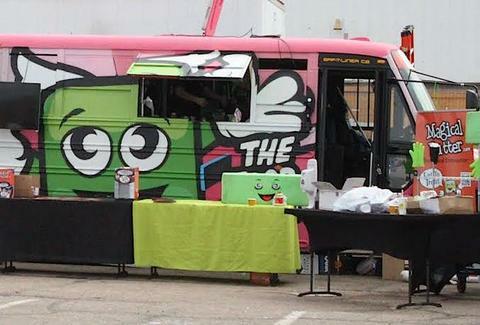 Weed has long been a clandestine driving force for food-cart culture. Now, thanks to some states' governments finally ceasing to be squares and just, you know, go with it, people can get their buzz at a food truck, rather than at home beforehand. Unveiled at Denver's Cannabis Cup, Samich Truck (standing for savory accessible marijuana infused culinary happiness) is a collaboration between Magical Butter and two chefs with extremely high ambitions to make food that satisfies more than the stomach, preemptively curing munchies before they even happen. The inaugural sandwiches from the converted 40ft school bus include a sunbutter & jelly, a take on banh mi, BBQ pulled pork, plus tomato soup, all of which pair extremely well with a little Floyd. The truck will set up shop in Seattle this Summer, when the state joins Colorado in legalizing recreational marijuana sales. Because pot-infused banh mi is a gateway food, the company plans to eventually deploy a traveling fleet of trucks to other cities where they can legally operate, and will also launch an app so you can find a truck near you and end up taking the longest lunch break ever. Andy Kryza is a senior editor on Thrillist's national food and drink team, and is seriously considering getting a Summer home in Seattle. Follow him to extended guitar solos and late-night Call of Duty freak-outs via @apkryza.